Often, when an opponent attacks you at the net, the best option is to attack and hit a hard shot right back. However, often that is not possible if we can’t hit down on the ball because their attacking shot has been hit down on us. And if we try to attack that right back then there’s a very high chance we will hit it in the net or it will go sailing out. We want to learn how to effectively block hard shots when we’ve been attacked up at the NVZ line and we aren’t in a good offensive position to attack back. In this case, we must defend and hit a shot that will attempt to neutralize their attack. So the goal at this point is to block the attacking ball and hit a reset shot back into their non volley zone so that it’s an unattackable ball so you and your partner can get back into the game. This will be your best shot option whenever you get pushed off the line and are now out of position or anytime you find yourself stretching/reaching for the ball or if the ball is jamming you up into your body. These are times that you should not speed up the ball, because ash this time, you need to buy some time. Give yourself time and hit a slow shot that drops in front of your opponent’s feet to give you time for you and your partner to come back up to the net and also ready yourself for the next shot. In order to drill this shot with two people, one person will be working on the shot and the other person is going to be hitting medium pace shots at you and also attempt to get it by you and as you get better, they can pick up the pace fo the ball so that you get better and better at hitting a soft shot no matter how hard the ball gets hit at you. You’ll want to work this drill at the net and also from around no man’s land. Now, of course, no man’s land or anywhere well back off the NVZ line is not the ideal place to play in a point. But, you are going to yourself in that position and it may be the best place for a shot or two to give yourself time to defend depending on how the point plays out. Ultimately though, the goal is for me and my partner to get back up to the non volleys online and we’ll do that by successfully dropping a ball in the kitchen that is unattackable. Easier said than done but definitely possible and certainly a trainable skill that can improve over time when drilled. 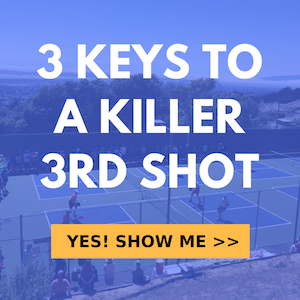 This shot is key to helping you move up the ranks of pickleball levels. If you don’t have this shot, you will get permanently stuck at being a intermediate player at best. There’s a few things that are really key to hitting this reset shot or blocking shot. The first thing is to NOT swing. Most people swing at this shot and you’re basically dead in the water when you do that. Basically, you just stick your paddle out there and let the ball bounce off it. You use the pace of the ball to get it back over. You don’t have to add any pace because the ball already has a ton of pace on it therefore you really don’t need to swing AT ALL. Don’t punch it. Just hold the paddle out there with an ever so slightly open paddle face and let it bounce of your paddle. If you swing or punch at all, it’s definitely going to go a lot further than you’re intending it to go. So, in addition to having the contact out in front, that paddle face needs to be slightly open to give the ball a little arc over the net. Have a stable grip, meaning don’t be wrist and hold the paddle a bit loosely in order to absorb some of the speed off the ball. The key is to absorb pace, not add any and you’ll do that with easing of the pressure of your grip and letting the paddle retract slightly as the ball makes contact with it. That in combination with a slightly open paddle face is what will allow the ball to get over the net and drop in the kitchen. If you find the shot didn’t do what you intended, then adjust either the grip pressure or the angle of the paddle face but PLEASE, do not swing at that think. Ok! Promise me you won’t swing. It’s so so so important. You do not need to swing when blocking/resetting. In fact, you MUST learn NOT to swing if you ever hope to get this shot right. To see how all of this comes together on the court, check out the video at the top of this post.